Situated entirely north of the Arctic Circle, Kobuk Valley National Park preserves a natural landscape rich with ancient history and caribou. A true wilderness, there are no roads, no trails, no campgrounds and no wilderness center — backcountry is the only country in this park. A visit to Kobuk Valley National Park requires great effort. With no roads providing access to the park, the primary options are to fly from Anchorage to Kotzebue or from Fairbanks to Bettles and then enter the park through various taxi operators. In the summer, access is primarily by plane or boat. In winter, snowmobiles or planes shuttle visitors into the park boundaries. The park offers several different terrains for the skilled backcountry explorer. The Baird Mountains make up the northern portion of the park while the 25-square mile Kobuk Sand Dunes— where temperatures can exceed 100 degrees Fahrenheit in the summer –resides in the southern region. The Kobuk River Valley runs through the heart of the park. 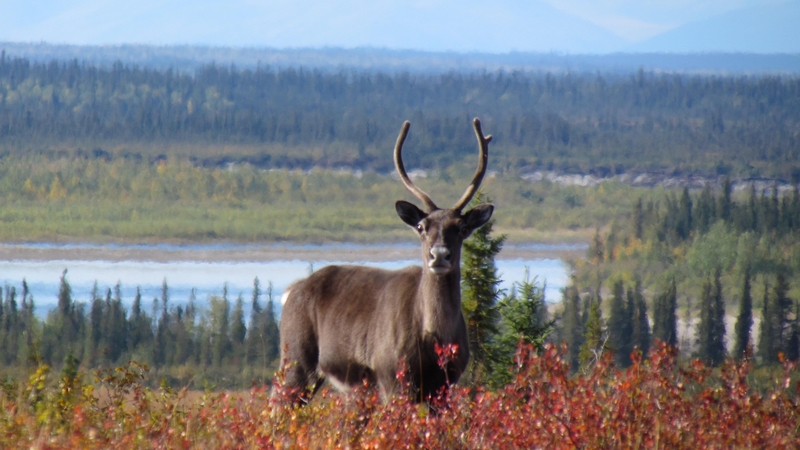 A visit to Onion Portage, where thousands of caribou cross the Kobuk River each year, is a must for any visitor. Seasonally, summer brings long days and wildflowers. For about a week in early July, the sun never sets and temperatures can reach the 80s. Late August provides a picturesque and lively landscape as Aspens begin to turn yellow and caribou begin migrating. Kobuk Valley offers great adventures to those who visit. Hiking and backpacking possibilities are endless, though there are no trails or established campgrounds in the park. Floating the Kobuk River is a 350-mile experience as the slow-moving current provides a 5 to 7 day journey from Ambler to Kiana. Dog sledding offers an alternate way to traverse the landscape in winter months. Scenic flights are a popular activity to explore the park from the sky. Commercial guide services are available on a through authorized providers. The largest caribou herd in Alaska, almost half a million strong, migrate through the park each year. The park is also home to the gray wolf, American black bear, grizzly bear, Canada lynx, wolverine, and red fox. The Kobuk River is filled with salmon and trout. Many Alaskans continue to live off the land today, relying on hunting, trapping, and fishing as a primary food source. Onion Portage, where for thousands of years large herds of caribou have crossed the Kobuk River, is an important archaeological site and National Historic Landmark. Discovered in 1961 by archaeologist J. Louis Giddings, the site yielded artifacts dating back almost 10,000 years as native cultures gathered at the crossing to hunt. Kobuk Valley National Park was established in 1980 by the Alaska National Interest Lands Conservation Act. It is one of the least-visited parks in the entire system due to its remote location. Click to see a detailed Kobuk Valley National Park map.